2017 has peppered my dome with gray hairs. The year started and ended with threats of layoffs looming, people who survived the layoffs received the work of the people who were let go. The house had an issue with the foundation, just the part under the front porch, but enough of a part to be fairly expensive. I did achieve some sort of balance, my career advanced a couple rungs throughout the madness, but it came at the expense of a little health and a lot of family time. It wasn’t all bad though, had a lovely vacation in North Carolina, nice hikes with the family, lovely dates with Jaclyn, and a medical miracle with my dog Benny. When I toast 2018, I will be wishing for one thing…a tiny bit more tranquility next year. I will post my favorite pictures of 2017 soon, but here is another batch from the past month and a half. In my new job as national sales director, I have to travel around the country. I have had the opportunity to visit places I have always loved (San Francisco – above) and get to see some places I have never been, like Oklahoma City (below). Oklahoma is a fascinating state, I cannot wait to someday go back. Saw lots of nodding donkeys, cowboys, and big signs for all you can eat catfish, the whole thing just seemed like a tall tale. I’ve traveled to San Fran dozens of times over the years and always see it in a different angle each time. This time all the hotel rooms were too expensive for my liking so I stayed outside of down in Berkeley. The hotel staff said if I need to be in San Francisco by 8AM, I should leave at 5AM to beat the traffic. Still being on Eastern Time, I was out the door by 4AM and wandered around a dark San Francisco for a couple hours until it was time for my appointment. I made myself at home in several coffee shops and hotel lobbies to kill the time. A stranger gave me an umbrella, a lifesaver. The picture below if of Oklahoma City’s memorial to the hospital bombing. I drove into Oklahoma City after working in Kansas all day. It was a six hour drive and I arrived late at night, the memorial was open and I walked through it. You hate to give out awards for best memorial, I do not mean to trivialize it, but it was the most powerful, elegant, and thoughtful memorial I’ve ever seen. 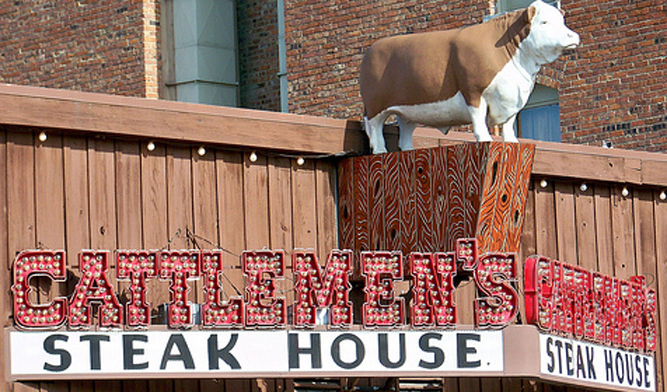 I also had a steak at the Cattlemen’s Steakhouse in the Oklahoma City Stockyards. I was the only dude not wearing a cowboy hat, but they took good care of me and I enjoyed the meal. I’d go back to Oklahoma in a heartbeat, plus they have the best state flag I’ve ever seen. The image above is the construction crew working on our front porch. Digging out the foundation and building a new wall under it. Home ownership is filled with expenses where you pay a lot of money and after all is said and done, your house looks exactly the same. The picture above is one of my favorites. It was a freezing cold day in Ohiopyle, in fact, snow was coming down throughout most of the day. The water of this river, the Youghiogheny, is always cold, but I am sure it was even colder today. The river was higher than normal, an enormous boulder about 4 feet off the shore stuck out of the swollen water. Jaclyn turned away a second and I jumped out onto the rock. She yelled at me and the kids were in awe. It was definitely stupid, the water was freezing and cold and rushing like mad all around me. I stood on my own little island and snapped a couple of pictures. Benny loves Ohiopyle and the Youghiogheny River more than anything, he ran around all over the place, tearing up the river banks, rolling in the sandy gravel, bathing himself in the dirt and debris. Then he casually walked into the water and took a long dip to rinse himself off – completely unphased by the freezing temperatures. Visited Columbia, SC to see my sister-in-law’s family. I got a kick out of how much Columbia’s monuments and historic plaques criticized Sherman for destroying their city. I guess I really am a yankee as I was not at all sympathetic. These turkeys fired the first shots of the civil war at Fort Sumter and I would think they should have anticipated some terrible consequences of picking a fight with the United States. I would have love to hear a debate between Sherman and Lincoln on what America should have done post the Civil War and what they would do differently. I look forward to seeing friends and family next week during Christmas, cannot wait to rest, relax, and spend time with those who matter most.